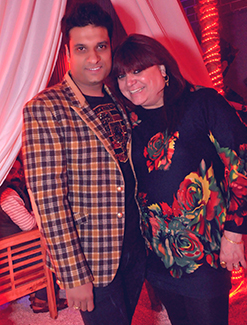 Entrepreneur Nitin Chawla aka Nonu chawla, a steel industrialist & promoter of Club Zygo & Cinema Lounge , hosted a mega bash recently at his Place Cinema Lounge, ( a Bollywood theme-based lounge) in GK !!! Gala evening was high on glamour and sporting spirit where glamour and cinema met India's passion," Cricket". To celebrate the spirit of the ongoing World Cup and cheer team India MTV SPLITSVILLA Girls led the charge into the revelry along with the fashionistas of the capital. The air was thick with patriotism as those present were screaming their lungs out cheering for team India. The spread was delectable and scrumptious and added a gourmet flavour to the evening. It was also a very glamorous time as the celebrations were joined by gorgeous MTV SPLITSVILLA Girls Khushi Bhatt,Sonali katyal, Etansha gupta. Rashi Sharma, Nisha Rajpoot along with Sylvie, Jatin Chawla, Movie Star Sunil Mann, Food critic and stylist Naveen Kaushik , Sandhya Thakur, Priyanka, Nisha Rajput, Puneet Handa , Moet Brar, Aashim and many more from social circle joined in the sporty fun . There was a veritable competition with lip smacking food and an ambience filled with music, cricket & fashion. All the invitees were in high spirit enjoying the lavish spread of delectable food over unlimited rounds of scotch along with peppy music. The celebrity spirit was palpable as everyone enjoyed each aspect of the event viz food, fashion n Cricket.